I hope you all had a great weekend! Ours was full of good food, family and friends + a little fashion, of course. Speaking of, how uh-mazing is this metallic skirt? I absolutely died over it when I spotted it in Solace Boutique and immediately had to add it to my closet. I love the bight colors mixed with neutrals + gold. Call 864-252-5322 to order - only $45 + free shipping to the first 5 orders (standard shipping is only $5). Hurry, hurry - you won't regret this one! That metallic skirt is definitely amazing. I love it! Love this look! Gorgeous colors together! Your skirt is so cute! I love the way you styled it! That skirt is gorgeous & I can't believe the price! This is a great look! 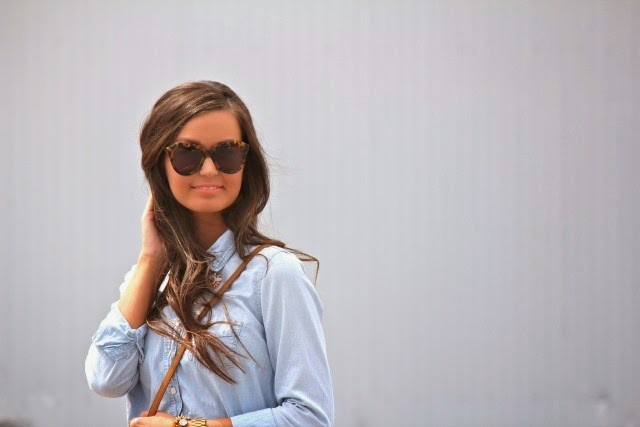 I really love how you paired it with a chambray button down! Love everything about this outfit! Your skirt is beautiful! That skirt is fabulous! I'm drooling over it! that skirt is really gorgeous and paired with the chambray and sandals it's perfection! Love this look!!! Great skirt!! !